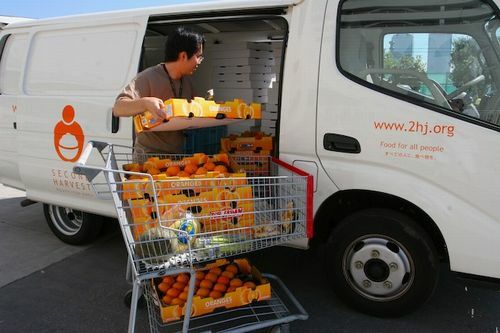 A Japanese food bank operates to collect food products that are discarded due to high quality standards of food manufacturers and provide the food to orphanages, single mother shelters and other facilities in need. The food bank is called Second Harvest Japan (2HJ), a Japanese non-profit organization, started the food bank, which was an idea originally born in the U.S., in 2000 as a pioneer. It distributed 300 tons of food (worth about US$1.2 million) in 2007. 2HJ estimates that more than 650,000 people currently have difficulty affording food in Japan, while public data show that approximately 20 million tons of food products are disposed of annually. Concerned about the situation, 2HJ asks food-related companies to donate food products which are safe to eat but have lost market value due to packaging defects, proximity of expiration dates or other reasons, for distribution to people in need. Companies also have a large incentive to take part in this charity program that provides an alternative to dumping food products that are still safe to eat, as it allows them to lower the cost for discarding food. The total cost reduction of the participating companies amounted to about US$390,000 in 2007. From the viewpoint that poverty-related problems should be shared among all of us living in a society, 2HJ has been committed not only to food bank efforts but also making policy proposals to address measures against poverty. With an aim of promoting the food bank that is still new to Japan, 2HJ held a symposium on the food bank on October 16, 2008, for the first time in Japan, with participants including food manufacturers, related companies, citizens and the mass media.